Skymark - Find A Place In This Crazy World. Vinyl 12. Bleep. 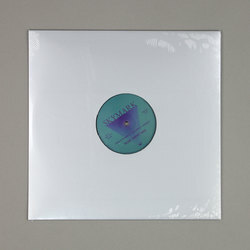 Skymark’s ‘Find A Place In This Crazy World’ first appeared on the Swiss producer’s 2015 LP Waves From The Nucleus which dropped through his own Modern Sun Records. A mixture of Moodymann-style deep house, disco fetishism ala Soundstream and Motor City Drum Ensemble’s breezy grooves from an imagined Midwest, it’s such a perfect Rush Hour release that the only real surprise is that Dutch label didn’t snap the track up sooner. It also makes complete sense that Ron Trent should have been roped in on remix duties. His ten-minute re-rub stretches the original out into a languid conga-house roller of the sort that will keep clubbers happy for years to come.